Very Good. The totally revised edition of a groundbreaking bestseller, first published in 1986, provides information and guidance in starting and maintaining a small business or franchise in the 1990s. Trade paperback (US). Glued binding. 288 p.
Good. The totally revised edition of a groundbreaking bestseller, first published in 1986, provides information and guidance in starting and maintaining a small business or franchise in the 1990s. Trade paperback (US). Glued binding. 288 p.
Very Good. 0887307280 ALL BOOKS SHIPPED WITHIN 1 DAY OF PURCHASE! Good. 0887307280 ALL BOOKS SHIPPED WITHIN 1 DAY OF PURCHASE! 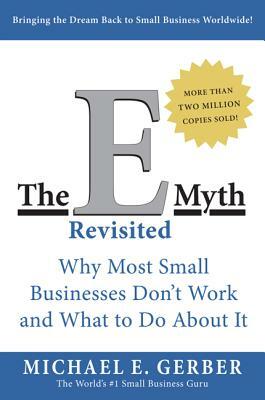 The E-myth : Why most businesses don't work and what to do about it. This is a must read for all business people. The way Mr. Gerber assesses business owners is brilliant. I've greatly benefitted from this book. 19 Chapters of Technical Dirty Work. Author Michael Gerber directs you thorugh the meat of Business Ownership, and provides many details of Business Planning. Not only does he help you develop a business plan, he also provides fictional character Sarah, to view success . Time consuming, but helps the entreprenur avoid allot of pitfalls. Highly recommended. Lots of answers to questions I didn't even know I had about running a business. My entrepreneurial son recommended this book, and I can see why he would. It puts into a sort of course the pitfalls for ambitious business adventurers. I thought it was useful, but tiresome to plug through. Much of the information was crucial, but not new news.